So my finishing of projects over the summer leaves me in the odd situation of having no major projects on needles or hooks. Ok, I have a few rows on a secret project to finish, and a thrummed muff that is staring at from the corner but I want to start something new. As you know well, a new project has to fulfil several ‘rules’, and these rules will change depending on what the project needs to fulfil. I’d quite like it to be blue, don’t know why, just would – you know how it goes. Now, I have lots of projects that don’t fit the ‘must be done on a coach’ requirement – small beads, complex lace charts, fiddly stitches… In fact I was surprised at how many projects I have that fall into that category. 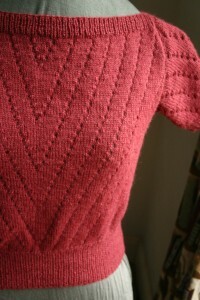 The Tirrold Jumper – laceweight, purple, bottom-up jumper sweater with an eventual interesting lace panel at the top. The yards of stockinette and rib have to be done at some point! Finally, Laura is a crochet project that I’ve had in my queue for a while. It’s beaded, so not appropriate coach crafting but I have some lovely fyberspates purple lace that didn’t work for the project I bought it for or I could go a little heavier and use the 4ply seasilk I have. I also don’t have a crochet project on the go at the moment, so I might just “cast” this one on as well – despite the fact I’d have to buy beads! Of course in the process of trying to decide what to do next I emptied out my entire stash onto the study floor and even had a bit of clear out (gosh, go me!) 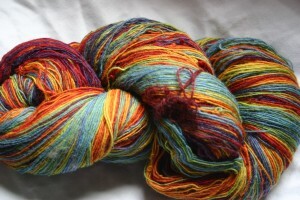 – as do I really need that half skein of bright orange acrylic? i’ve tagged the yarns I have for specific projects and made a list – I might even check it twice! have lots of things to for the next few months now at least. Right, best get started then..
Hello, pull up a chair, tell me – how have you been? It’s been simply ages, and that is entirely my fault. I apologise. I can’t believe it’s July since we last spoke, so this is isnt’ going to be a mega long post – I’m going to break it into bits. There’s what I’ve achieved crafting-wise, and details of my trip “Abroad” to Europe over the summer, and lots of other bits I’m sure I’m forgetting right now but will remember once I start talking to you. So this post is going to be a quick(ish) summary of everything I’ve got done over the summer. Which makes it sound like loads, but don’t get too excited – it really isn’t. I started by finishing (at long last!) my Jan/August Sweater. 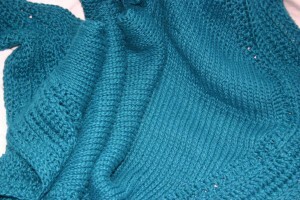 It was such a joy to finally get it off the needles, and everyone complements it when I wear it. The excelana yarn was a joy to work with and if I ever get around to repeating a pattern this one will be very high on my list. I’m also absolutely solid in my Portuguese technique now! 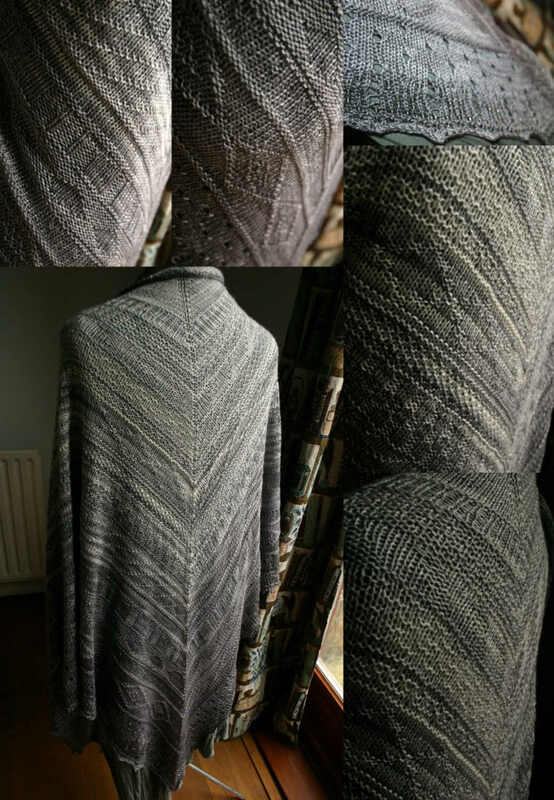 I don’t think for one minute that repeating the pattern would take me the 2 years that this one took me – maybe a couple of months as it is a quick knit and an easily memorised pattern. I also finished my Herbie shawl (after 2 years), replete with beads, this week and it’s currently blocking on my front room floor. I’m delighted with how this turned out – the shading, the beads, the size everything. 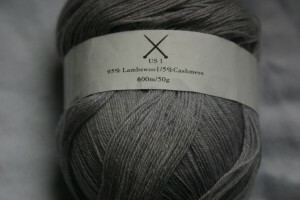 I love it, and am still manically in love with The unique sheep yarns as well. Really looking forward to getting the wear out of this one as the nights turn cooler – it’s HUGE. The Herbie Shawl is also known (affectionately) as the Attention Deficit Shawl as every time I got bored of a pattern I changed it! I finally gave up trying to get the ends to match on Love is a Prism – there is only so much ripping back I’m prepared to do, and though my scales told me I had more than 1/2 my yarn left at more than the 1/2 way point there still wasn’t enough to do the last three rows. Gah. 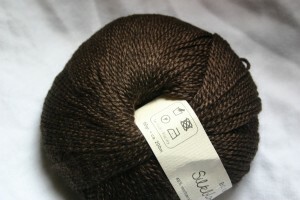 However it’s lovely and heavy (just over 300gms) and the drape from the linen/bamboo blend is just stunning. 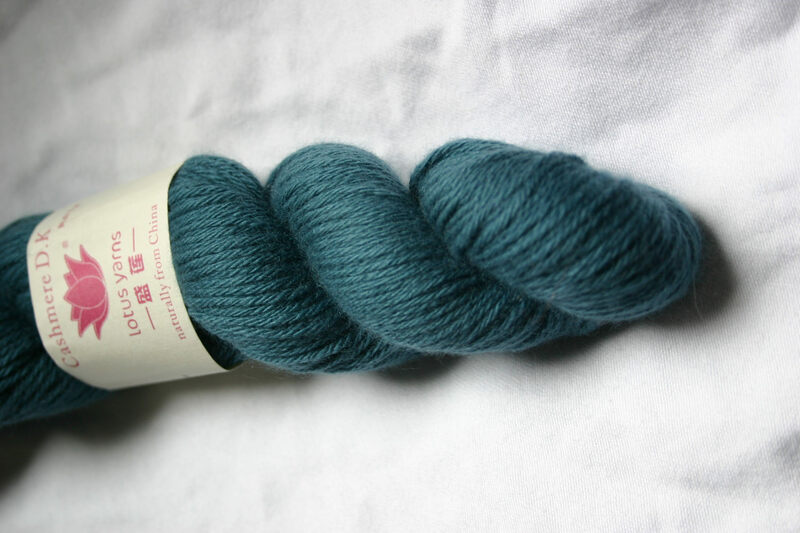 The colour is outstanding and I can well see me using this yarn again for summer tank tops – if it means another trip to France so be it. I haven’t blocked it, but it’s gorgeous as it is. I did a couple of samples for the texture and colourwork class – of which there will be more in another post – another one of those ‘learning experiences’ where for some reason on the day my brain went a bit dead, and the colour theory section of the course could have been done *much* better I believe so I’ll do my best to get some of it up on here. Having travelled down the country all day by train, an 8 hour train journey, during which I swapped between knitting, reading and gazing out the window, I arrived in Vienna to night scenes and the drizzly end to what had been stunning weather. However the weather couldn’t stop me and we did another whistlestop whirlwind tour of sights and sounds and sachertorte. Vienna is big on non-symmetrical symmetry – lots of conversations contain the sentence “this building was going to have a matching one opposite but…” and it’s the most gothic, beroque, overwrought, wedding cake of a city. It reminded me strongly of Buenos Aires and had a very Irish atmosphere while being very definitely germanic. I particularly loved the art deco and art neuvo flourishes everywhere, from the famous cupola gracing one of the ‘tube’ stations to little hand paintings on doorways. Going from a protestant to a catholic country was actually quite startling in a way I hadn’t predicted. Having grown up with a mix of churches and styles to go from the simple, open almost auster protestant churches to the heady wrought, dripping in gilt (and guilt! ), ornateness that is the catholism I was brought up with was amazing. We visited far too many places and saw too many things to mention, but highlights included Lobmyer glass, Klosterneuburg Abbey with it’s beautiful enamelled alter screen, St Patricks, The Summer Place and a lovely walk around The Dorotheum (auction house). The city centre is compact and very easy to get around with lots of ‘hidden’ feeling alleys and side streets – and of course the ubiquitous coffee houses. I was spoilt by M and her husband (and two very friendly cats) – and lots and lots (and lots of beautiful handmade patchwork quilts). I was also spoilt by M’s very lovely parents, who welcomed me into their home and made me eat and drink lots of wonderful foodstuffs. I met a Vienna branch of a knit group, disingenuously in a Starbucks as the only place that stayed open late enough, and had a wonderful time sharing fibre stories. Of course I visited more yarn shops. Another ‘high end’ luxury store with skeins on the walls, it’s own range of t-shirts (I particularly liked “knit fast, die warm”) and the cutest sheep project bags, but M beat me to it! The other was the size of a cupboard (it was crowded with the three of us) but just the most wonderful place. Another ‘taken on by an avid knitter when the original owner retired’ shop – and almost as full with stock – but only because the space was so small! Very friendly, very fun and we had a wonderful time. 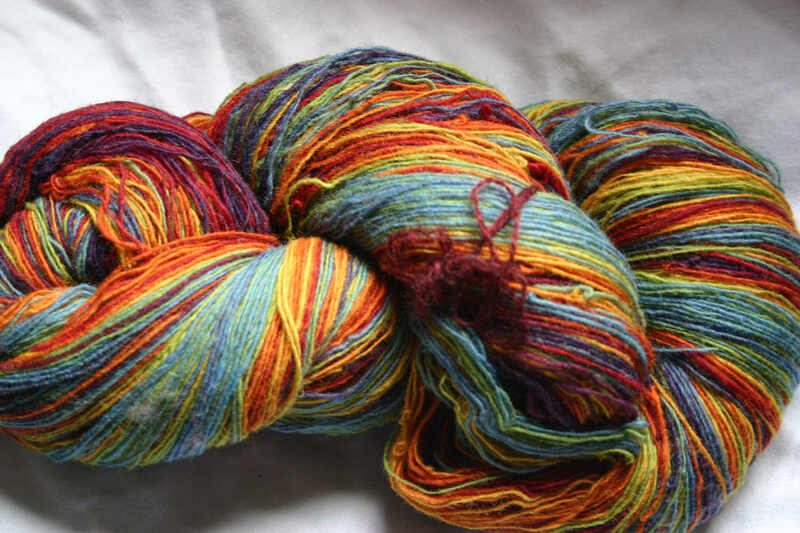 In both shops there were one or two skeins/balls/hanks on display in each colourway for each yarn type and you took your colour to the counter and told them how much you wanted – at which point assistant would disappear into the back and return with what you wanted. I kept wanting to hum the theme tune to Mr Benn for some reason. I bought lots in Vienna, the yarn shops were lovely and though there was very high end expensive imports lots of it was very cheap. I’ve even let Purlescence have a little squish to see what they think as I’d love to be able to pick up some of these brands without having to travel Austria! 2 skeins of Isager Spinni and 3 of Isager 1 (100% alpaca) in a beautiful sort of faded vintage teal colour to make (at some point) Camomille. 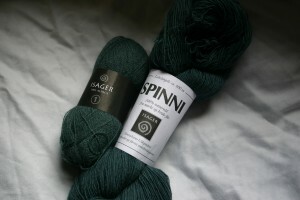 I also bought 2 skiens of Isager 2 Alpaca in black for a Spectra. I know I can get this here in the UK at Loop, but it was a lot cheaper in Europe. 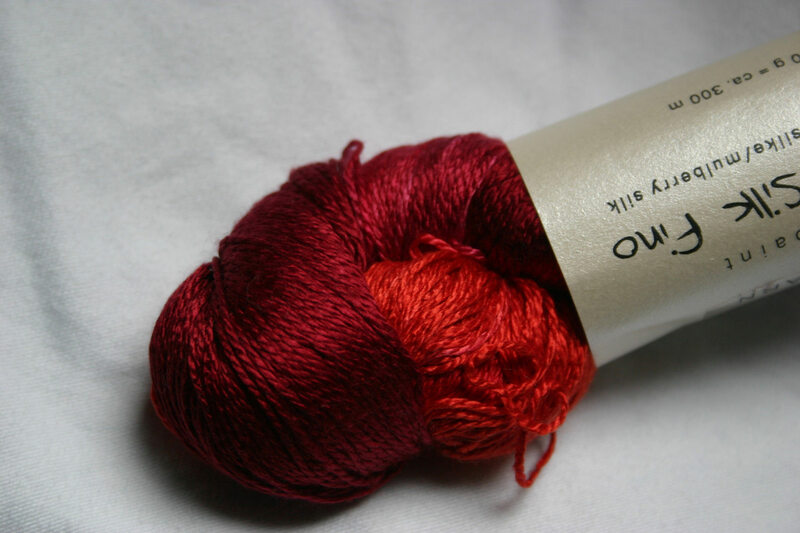 Swiftly followed into the basket by BC Garn’s Jaipur Silk Fino – 300m of pure mulberry silk that I genuinely have no idea what I’m going to do with it, but it shines like it’s lit from within..
then I came across a whole new company (well to me anyway) with the wall of deliciousness that was Lotus Yarns. 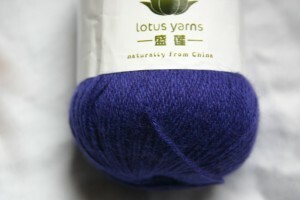 Into the basket fell a ball of Miya – a rich purple laceweight that is 70% mink (! ), 20% merino and 10% silk. then, having become jealous of all the fine laceweights and cobweb weights a brave little skein of DK Cashmere made the dive. And not just any cashmere, oh no, this was 100% Mongolian cashmere. I have no idea is this is better, being a bit of a cashmere virgin, but it just happened to match the Isager bought earlier as well so I’m thinking mittens to match the shawl eventually, maybe,.. I also had several close run in’s with mushrooms – more on that in another post. Zurich is a genuinely beautiful city set in stunning countryside. My five days there were packed with things and I barely scratched the surface. Apologies in advance as my camera wasn’t working so there are no photos to share. The city as cosmopolitan as you could hope for, with one of the most comprehensive public transport systems I think I’ve ever seen – buses, trains, funiculars (whee! ), trams, bike hire – it was all going on. It’s also impressively expensive in some respects – it made the London Travel card look positively cheap, and eating out is definitely for special occassions. Switzerland seems to be very proud of it’s dispirate groups, and the city reflects that, with very different atmospheres in it’s different districts and areas – some of it feels very English industrial, some of it very French town square (missing only the boules) and some of it undoubtedly Swiss. The city centre is well worth a visit, particulalry the old town, if you are only passing through. However if you have more time – a tour on the lake (which issomuch bigger than I thought it was, and we went on the day of the Annual Swim across in which 56,000 people took part! ), a walk up (or down!) Uetliberg for it’s stunning views across the lake and the surrounding land and visits to both the Fraumünster church (famous for it’s Chagall stained glass windows) and Grossmünster with it’s stunning “alternative” stained glass windows by Swiss artist Augusto Giacometti added in 1932. We also took a trip out of town to visit a local Palace, which was fascinating and meant I got to travel through several Swiss villages – all of which look exactly like you would expect them to from chocolate box depictions over the years – wooden shutters and steep roofs with over-abundant flowered window boxes. It was lovely. I was more than ably looked after by A, her husband and excitable Bob clone Max. And of course staying with crafting friends meant there were visits to yarn shops and crafty goodness. I was surrounded by spinning wheels (seven to be precise!) and spindles and lots of books I don’t own and an impressive stash. A’s crochet friends welcomed me with open arms (despite my Swiss/German being even worse than my French) and I saw some outstanding samples of filet crochet used as curtains, tablecloths, dresser runners…. I only went into two yarn shops while in Zurich, but they were chalk and cheese. One was on the ‘main drag’ in the Old Town and was set up like many high-end luxury yarn stores in the UK. Yarns were grouped by colour and then by weight (cobweb at the top, bulky at the bottom) around the walls of the store – which was very pretty, but pointed out an almost non-existance of varigated yarns. Haberdashery was limited and nothing had a price. I did pick up a set of square knit pro circular needles as I hadn’t seen them elsewhere, but little else appealed to me. 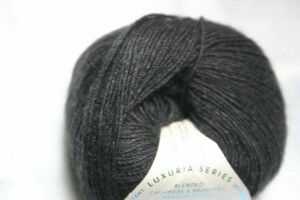 It had a good range of yarns but I got the feeling I couldn’t afford any of it before I even started. The second store was more ‘hidden’ – and in the start of a theme I was to revisit in Vienna, this store had been taken on by an enthusiastic knitter when the original owner retired. Now, I have to say that the owners were lovely, very friendly and I really enjoyed the time I spent there (and I did buy stuff, more about that in a second). The shop was HUGE, two large rooms, but it was very, very, difficult to see how much space there really was – or what was in stock. The owner was working towards her PhD – Piled higher and Deeper – in stock management. There were some really lovely bits and peices – and some surprises (Rowan Silk Haze for £25 anyone?) but you really had to dig and ferret, and not everyone is comfortable doing that. It’s a shame as this could be a really lovely shop. and this puff of fun may have found it’s way into my bag..